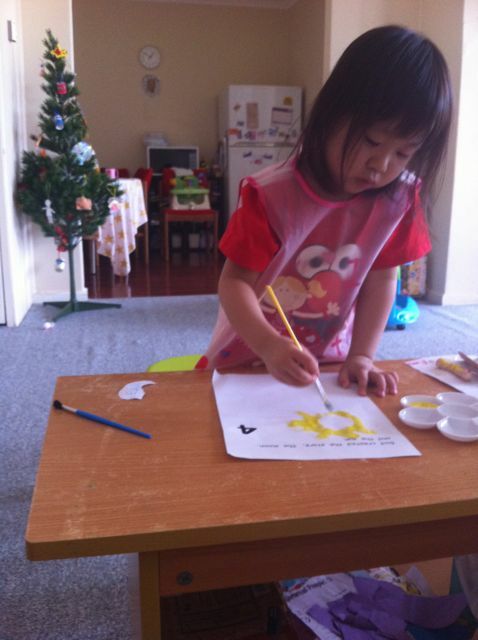 I wish i have more time to do craft / read / play with Eliza. Sometimes she's so engrossed with her stuff that i don't want to interrupt her. Sometimes i have chores to do. When my mil leaves, i also need to learn to put these chores aside and be there for them instead of doing the 101 chores. Then again, there are things that need to be done in the day which i can't do when they have gone to sleep! It is great that Eliza has joined us in helping with the laundry, be it folding, or unclipping or clipping or passing me the clips. Letting her join in the chores helps though there are things that she's still too short to do or it's not the way i want to be done (like clipping the clothes on the dryer which she arranges in the most interesting way -_-). Sometimes i wonder what keeps me so busy throughout the day which of course....getting Emily to sleep is one big amount of time taken! Wondering where my chunk of time for doing activities with Eliza went to. I'm wanting to do more craft activities with her now that she has so much fun doing these things, even though sometimes i do all of it and she watches. 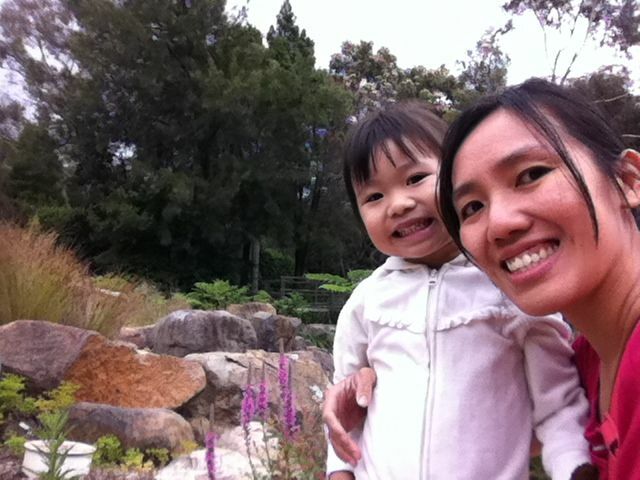 Eliza: I love you mummy. Even if you are old, I will still love you. Mil: tomorrow I will give you a big angbao! Eliza: I think...i can't carry it. I'm only a kid. 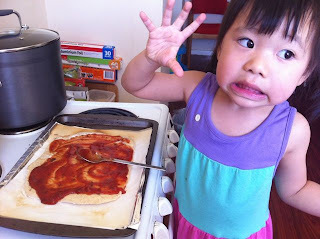 I ask mummy to help. 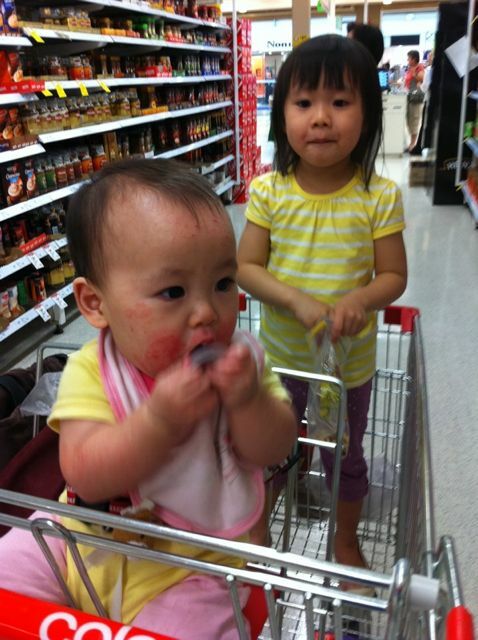 For the first time this year, Eliza understood the meaning of the angbao. Last year she just put it in her bag or gave it to me. Yesterday she received one, opened it and in a surprise discovered money inside! Wow! Haha. The innocence of a kid. This time she understood that money is needed to buy things and we get money when mummy or daddy works and that she's still a kid and can't work yet. Missing the festivities and food and family in SG. It's quiet here but we'll be going out to the National Museum of Australia for some kid activities n shopping after that. Hope Emily will take a good nap later. It has been a struggle getting her to sleep this morning, 40mins! With almost 20mins of screaming and struggling. And then she's only going to nap 30mins. Time to get her to nap without me in the room. Grrr. Oh well. Happy new year too! :) 7 more days till Ww come back, finally! I love it that Eliza's sleep is a lot more manageable these days...essentially we tackle only the bedtime sleep. More or less no naps anymore unless she's really tired and falls asleep in the car. Well it's not that she is difficult to fall asleep...in comparison to Emily, it's that we can do more fun things with her in the day without worrying that she'll get too tired. And if she does, she'll catch a short nap in the car. The moment i carry her to her bed from the car, she wakes up. The good part is also that she goes to sleep much earlier which is about 8pm till 7am the next morning. The other good part is that when my mil wasn't around, she learnt to fall asleep on her own, in her room and wake up happy. It wasn't a easy thing to learn for her, as sometimes she'll wake up at night calling for us (usually Ww cos i'm the grumpy one if i go to her room), and then it's learning to wake up without someone beside her after sleeping with us (although in a different bed), almost all her life. I anticipate some adjustments when my mil goes back, but at least the bedtime part is still consistent (as in my mil doesn't stay in the room until she sleeps). 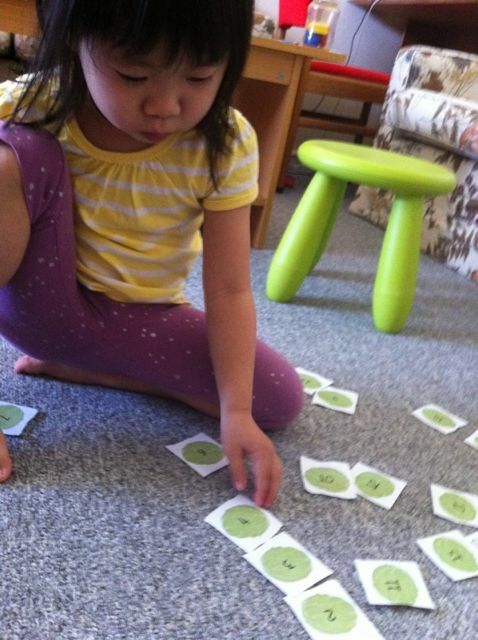 Learning independence, not that easy eh? but so essential. It was something we didn't quite teach her till we are here, on our own, without grandparents. Then it is the lil monster!! There are good days as much as bad days. Last week she was doing so well falling asleep on her own in 10minutes! I just sing her naptime song, put her in her cot with something to play and she'll be tired (rubbing forehead and face) and eventually fall asleep! i was like super wow! 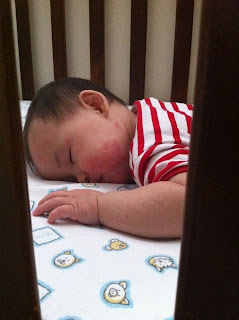 Even though she slept like 30minutes only, be it morning or afternoon nap. I'm still in the room with her till she sleeps, 'hiding' beside her cot and erm...iphoning, and trying not to look up (else she'll see me and want me to carry her). Then this week things took a slight turn for the worse..partially cos she was waking up so early at 530am and still not sleeping at 7am her rest of the day is a bit upside down. So her milk time clashes with her naptime and she ends up falling asleep nursing. Opps. Bad habit. And it happened at least once a day these few days. Opps. Encouraging the bad habit...oh dear. Good habits are hard to make and bad habits...just once or twice and she's stuck...have to unlearn it. Past few nights she was waking up at 9+pm after her bedtime at 7pm to cry and can't be settled till i feed her! I guessed it might be that she's not eating enough for her mealtimes and i have since increased her food for her lunch and dinner. Since i nurse her, i can't quite tell how much milk she takes but there are times when she's either too distracted to drink or just too full to drink and i can't get her to drink more in the day. Then again, it could also be because she has dinner and milk so early; dinner at 5pm and milk about 6pm or earlier if she is too hungry for milk to eat dinner. So i hope it gets better the next few nights. 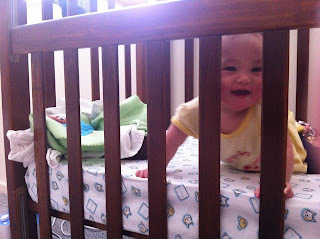 Her bedtime is really quite early compared to Eliza, which is also because of our lifestyle here that encourages it. Most books i read also recommend the 7pm bedtime which is something i really can't do in SG. How to, when work ends at 630pm, and it takes me 1hr to travel home. Plus, SG has such a lively night life to go out for supper and dinners and shopping with friends, that it's just a lifestyle thing. Still Eliza adjusted ok with that, maybe with sleeping more in the day, i guess. Cos she'll generally sleep from 9pm-7am and naps in the day, even when she was a baby. I've been checking out over here on how much a baby needs to sleep and it helps to know that it's ok that Emily sleeps only 2hrs in the day, considering she generally sleeps about 10-11hrs at night (including night wakings/cryings though). on good days, she manages to sleep till 7am...else she's usually awake by 6+am. On bad days when she is overtired, she wakes up at 530am!! :O Still i push for her to sleep longer if i can or bring bedtime earler, if i can. Well...i try. Then it's up to her to fall asleep. Else she's fighting sleep, wanting to get out or wanting me to nurse her to sleep. I'm also reading that the early naptime is good for babies, which i think works better for Emily i guess. We did try to get her to sleep later where she starts bedtime routine at 7pm but i can't remember what happened, whether it was good or not anyway. Still starting it early doesn't hurt. Plus i sent Emily to bed at 545pm today (cos she last woke from her nap at 2pm), and then she took so long to fall asleep..and eventually did at 645pm. phews!dunno if she'll do better tonight..cross fingers! Have been reading blogs and posts and parts of books. "As you deal with your children, deal with yourself always and first. This is what it looks like and feels like to walk with God, as a mother." "It is no abstract thing- the state of your heart is the state of your home. You cannot harbour resentment secretly toward your children and expect their hearts to be submissive and tender." 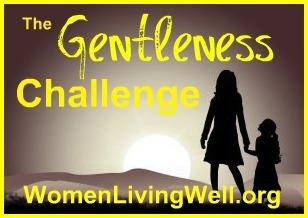 Read this from a mum's link and this year for me, I want to take up this The gentleness Challenge. Kids really test your patience, and add in stressors from anything or just a tired day and you might just respond in a less patient way. There are times when i regretted how i responded to Eliza. I always want to be firm with her, never to scold her loudly, but always to be kind and gentle. I also know what her trigger points are, sometimes she's tired, sometimes she's wanting attention, sometimes she just cannot accept the stern 'no' she hears from me. I'm thankful for the relationship we have, that despite the discipline we have on her, she will still in the end want to do what we tell her to and she'll say sorry for her misbehavior. We'll always end each meltdown/breakdown/whatever-down with a shared heart to heart talk. Though i don't want to ever raise my voice at her in a way that will demean her or become a bad example she learns from. "It’s interesting to note that all of the fruit of the Spirit address this very issue – the fruit of the Spirit is: love, joy, peace, patience, kindness, goodness, gentleness, faithfulness and self-control (Gal. 5:22). When we walk in the Spirit – we will be gentle mothers. But when we walk in the flesh – we lack all of these attributes. Which brings me to conclude that we must be in God’s word and on our knees daily – depending on God to help us be the gentle mothers he has called us to be. " Ohh..this little tiger rabbit...that's what my mil calls her. She roars! haha..Emily is loud alright, much louder than Eliza. I remember her crying when we bathed her in her first two months and make our ears ring from the intensity of the screams after that. That's one very distinctive difference from her sister. The other is on how difficult to get her to sleep. Not that Eliza was that easy either but Emily's like 9/10 on how easy she sleeps scale (10 being the most difficult) and Eliza's on the 5/10. At least Eliza will doze off, like Eliza likes to hug me and lean her head on my shoulder or chest and fall asleep. Oh well, Emily being the second child doesn't get that much of a luxury cos i don't have as much time for her as i had with Eliza. But Emily will hardly do that..she'll rub her face on my chest more likely. 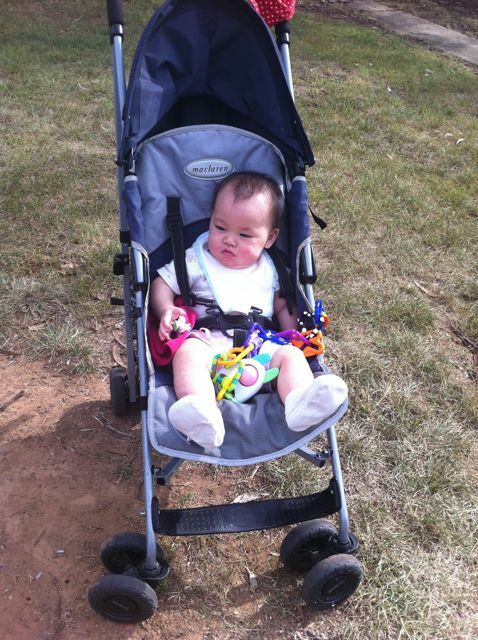 Eliza has been accustomed to the stroller since young and she takes to it really well (even now! )..so i remember that she'll fall asleep as i stroll to Tampines Mall or back. Emily? Nah...she finally can happily sit on the stroller when we go for our short morning walk. It is an improvement. Previously, she was just looking for me. whops! - Being very interested in what goes on the computer, especially when Eliza watches any of her DVDs, Emily will head towards the computer and be very excited, very. haha. Especially when we facetime or skype with Ww, Emily will fight with Eliza for a space to see, as much as pull Eliza away so that she gets closer to the screen. It's really funny but i gotta protect Eliza from the 'harm' Emily will inflict on her too. - She crawls all around the house. This is no time to be confined to the playmat anymore. - She doesn't put certain things in her mouth. Things like my iphone, her cream, papers (ok that's still in the learning stage..she just can't resist that). Everytime she does so, i'll sternly tell her "no-no, not in your mouth" and move it aside or take it away. Till, she nowadays either got tired of the item or learn it(?). - She loves Eliza, ahh-ing at her and looking at what Eliza does....or taking what Eliza is playing with (it happens the other way round also, just that Eliza will want the thing i give to Emily). So much so that she can call Eliza...chehcheh or 姐姐. yup..not the most exact pronunciation but she will see Eliza can call out jiejie. - She calls my mil "ah". haha...like calling 'ay'. - She loves being tickled and will give a most hearty giggle. - She loves sucking out the juice from watermelon, rock melon, pears, apples. 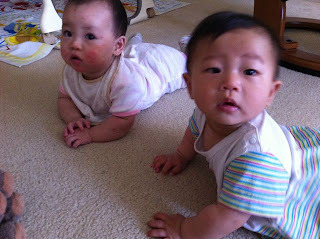 - If she eats something really sour, she'll give us a 'sour' face and give a 'shiver'. This must see on video..really super cute! - She is probably allergic to raspberry or yoghurt. I tried to let her eat baby yoghurt on sunday and she didn't quite like it cos it was quite sour. After that when we were at church, her ears and feet were quite red and she was really cranky. It got better in the afternoon when she did an epic 2.5hr nap. 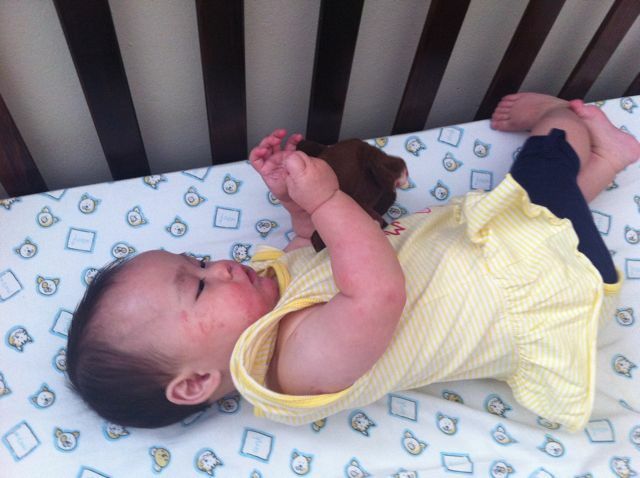 - She can fall asleep on her own, as in without me patting her or holding her to sleep. While it is not that often, it's a vast improvement from needing me to carry her to sleep and keep carrying her till she wakes. I learn how to put her to sleep and she learns how to sleep. she is persistent and so i need to learn not to create bad habits. Having kids really teach you the lesson about consistency! She still wakes up 1-3 times before 11plus when i go to sleep and her 11pm+ milk time. I remember that Eliza at that age also wakes up quite a bit in the hours before i sleep too, just that Eliza was not as fierce as Emily in terms of crying...so even though at times i would be frustrated, it wasn't as scary as Emily! haha. A smaller stroller for Emily? 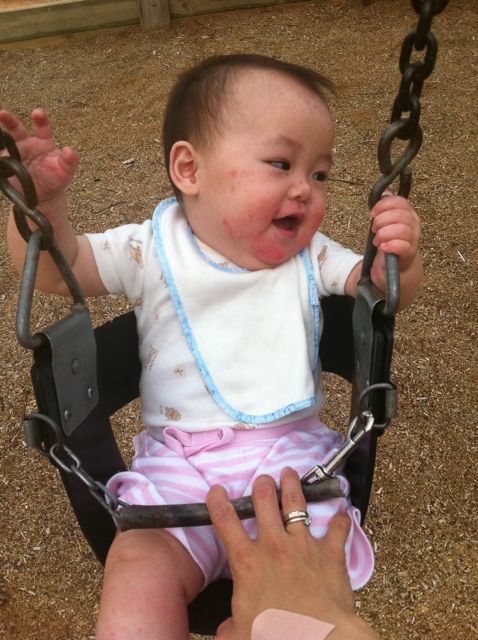 Happy with swinging! It was the first time she's on the swing. 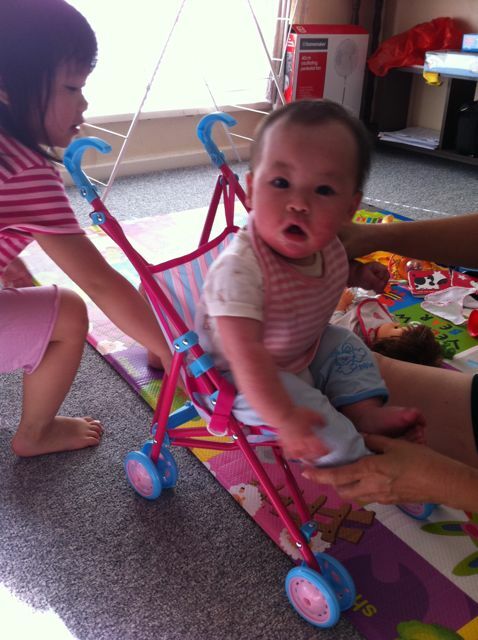 Looking really fierce on the stroller...actually more apprehensive. Emily also finally sits on the trolley instead of being asleep during our grocery shopping. Yeah we are kinda doing that..because Eliza enjoys it, and it's mummy focused time with her. She loves the craft parts, the singing and the cards activities. I'm not sure about the rest but i try to make it as fun as possible. Some activities take like one minute to finish. (that fast?) yeah...writing the date on the calender is that fast. But we'll keep writing till we see the pattern. There's reading to learn and i'm finding that although we read a lot of books that rhyme, i haven't really introduced rhymes to her yet. And i'm not sure if she has gotten the concept. 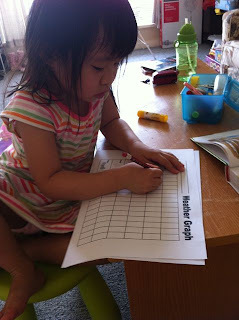 One of the activities is to do rhyme match, and it is one of the foundations of reading, that they can grasp the sounds. We'll take it slow at the reading front even though she can read some words by memory, like the way we learn to read chinese, hopefully she'll get the hang of reading phonetically. Still all day at home is fun for her, making her lego cities to no end...only fear is that Emily comes and destroy it or i accidently knock it down (oops!). And then it's her own craft or her play with her stuffed toys, or her house/tent/tunnel etc. Amazing how busy they can get at this age! Day 4 of creation...special activitiy for the week...here she's painting and later went on to do her other painting after all the paints have been taken out..why waste it. It will always have to end up with finger painting though. 5pm - dinner and milk. Bath after dinner. "The early days are tough. Let no one fool you about that! No matter what the age gap, it is always an adjustment when you add a member to the family. But when you see them playing and smiling with each other, you will know that your struggles are worth it!" It's the first week of the year! We didn't do anything spectacular during new year's eve (oh we wanted to watched the sydney fireworks but not with Ww in USA...spending the new year's eve at the airport waiting for his plane! hoho). So the girls went to sleep as usual, bedtime was as usual, everything quite as usual. 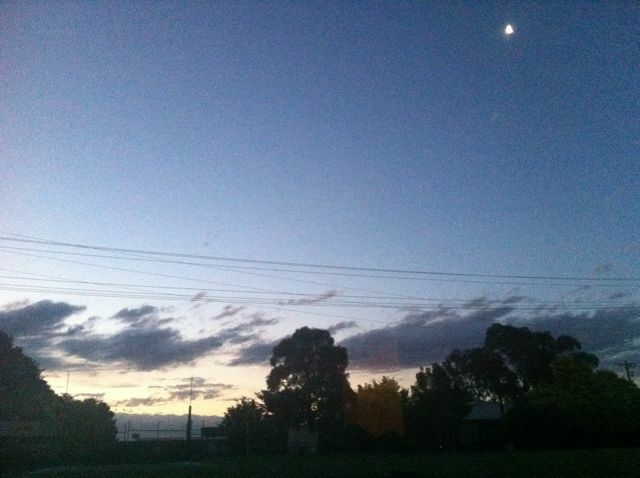 I heard the sounds of fireworks but couldn't see any cos it was just too far away & probably blocked by mountains. Looks like a lot...but really it's done in 40minutes or less and some are just done sparodically in the day, like singing etc. Or if she does an activity that's painting or crafty, she gets inspired and goes on to do her stuff. Once i got the hang of things, i can just pull out our activity basket and get on doing stuff. I just need to have the things i need printed or 'laminated' the night before. Yah and she's still bugging me to make ornaments!! Still it was a peaceful new year's eve night. Nice. New year's eve in pictures. Pre-morning nap unwinding time. Put rabbit as her bed toy...she only likes its tag, else it's flung to some corner. Good night and tata 2011!